How are HS/HTS codes assigned? The Harmonized System (HS) is a list of the classification codes for products that are imported or exported. Through this system, products are assigned a six-digit classification code chosen from a library of over 200,000 commodity listings. HS code is a six-digit number. However, countries can add subsequent digits in order to personalize the system for their customs purposes. For example, in the United States, imports are assigned a 10-digit code from the Harmonized Tariff Schedule (HTS), administered by the International Trade Commission. HTS classifies products based on their name, material composition and intended function. There are six General Rules of Interpretation (GRI) that are used for application of the HS. These rules provide the overall context for classification of the products, the logic that should be used and in which particular order. Each HS/HTS code has a corresponding rate of duty, and once a code has been assigned to a particular product, the shipper will know the exact duty cost for importing that product into a particular country. 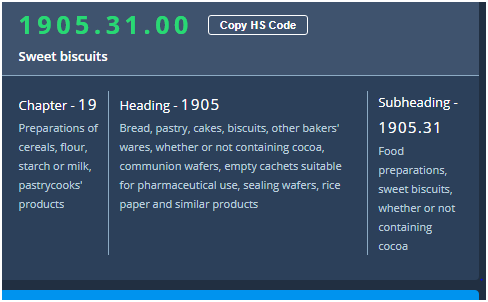 For example, if you are looking to export or import sweet biscuits, here is how HS code will be assigned.